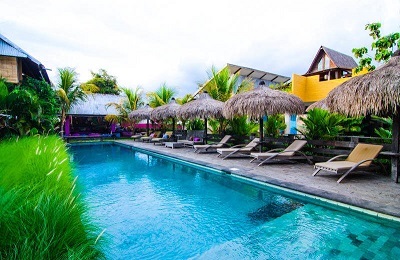 The Surf House is located on the powder white sands of Nemberala Beach, Rote Island, directly in front of the world class left hand surf break known as T-land. Our mission is simple, yet instructive for what makes us the preferred accommodation in Rote. Here, everything begins and ends with the ocean. 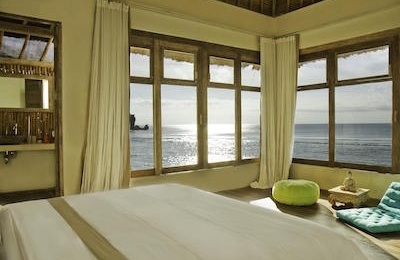 When you arise, the world class Nembrala surf break beckons you from your bed, easily seen from every room’s windows. No matter where you spend your time; all focal points from dining to lounging to lodging, lead to the sea. We have a passion for creating an idyllic Indonesian surf lodge atmosphere in a mosaic of ways that please not just the soul of surfer or fisherman in our guests, but also the discriminating foodie and cultural globe trotter. You can see it in the rich variety of our daily menus; you can hear it in nexus of the conversations amongst our multi-cultural guests at the dining table. Come see what all the fuss is about. With a commitment to maintain the environment, ecologically and culturally, we strive to bring you the best. Our rooms are designed to create ultimate comfort and relaxation, our food to tantalite and inspire, our services to accommodate and please. This room can comfortably accommodate a single guest, a couple, or up to 3 singles or a family with two children. Private bath and veranda with exercise bench. Sleeps one couple, 1 or 2 single, or a couple with a child. Single bed in separate room. Cereals and homemade granola. Coconut and fruit juice. Tropical fruits and yogurt. Pancakes with local Lontar palm honey. Toast with cheese, butter, peanut butter, or home made fruit jam. Scrambled eggs, omelets, fried eggs, cheese and tomatoes. Tea, coffee, milk and homemade muffins are available throughout the day to keep you going. Enjoy a varying buffet of roasted fish, indonesian inspired tapas, a variety of rice and salads, and much more. Our chef combines fresh seafood and a refreshing variety of salads to fuel your next surf session. Three courses are carefully crafted using the freshest ingredients. You can enjoy anything from Argentine Barbecue over an open fire, Italian dishes, Mexican night, sashimi fresh from the ocean, and calamari curries. International dishes span the horizon and special deserts finish it all off. Included in your rate, you can get to and from T-Land with ease on our tender, designed specifically to bring you to the point and back on your own surf schedule. Inquire within about transportation to other surf breaks like Bo’a and Sukymama. Our clear turquoise water is filled with abundant fish and coral. Explore what lies beneath with our snorkel gear or go out on a diving expedition to go deeper in the Indian Ocean. Fisherman, may we advise you that these island channels are, for the most part, unexploited by sports fisherman. This should be inspiration enough for the intrepid sportsman to book one of our boat charters out to fish Rote’s offshore islands. Each of these small gems offers an intriguing venue for trolling, bottom fishing opportunities and spear fishing. While the world of sport fishing is full of melancholy “should have been here yesterday” fables, our expert guide can assure you of the very best chance of landing some serious good eating. A good day can yield a bonanza of delicious prey. Our guests catch many of the sashimi quality Spanish mackerel and Tuna, as well as a BBQ bounty of Travels and Barracuda. Maria, our Argentine chef would be delighted to serve up, “Argentine style,” your catch of the day. Guided Day Tour: An island tour inside a comfortable car will take you to places you cannot find on your own, spots that are known only to in-the-know locals, worthy of a camera, good company and a Bintang. Bicycling: Our bevy of bicycles are awaiting your legs to take them through the village roads and up into the island for sweeping views and isolated white sand beaches. Motorbiking: If you’re keen to take a more motorized approach to your exploration, contact us for a rental scooter and drive off into the sunset. Quaint village roads allow for easy exploration. There is much fun simply touring the narrow, quiet one-lane roads that curve through the small beachside villages. Park your bike and kick off your sandals; around every corner is a new lagoon to discover. See more of the beaches and bays with a bird’s eye view. Rocky headlands provide picturesque photo opportunities and a new perspective. An adventure all its own, few things compare to the feeling of sailing in the tropics. With the steady trade winds, sailing on our 34 foot Warram Catamaran is a once in a lifetime experience. The trade winds that groom our perfect surf also serve another purpose: filling your kite and propelling you across the Southern tip of Rote. Kite boarders will find their paradise on a three kilometer strip of sand known as “Kite Beach”, with daily 18-24 knot winds throughout the regular dry season. Nusa Tenggara is considered birthplace of Ikat textile-arts. Here on Rote, you will frequently see a wide variety of shawls and sarongs and blankets among the townspeople. Most of which are intricately hand weaved. Keep in mind that the island is very private (non-commercial); consequently, it is often difficult to source a store or salesperson offering these wares. As such, be sure to ask our staff where you can see a good selection of these one-of-a-kind hand spun crafts. Rote is the most southern island of the Nusa Tenggara island chain in Indonesia. It lies a few miles south of West Timor and 150 miles from the coast of northern Australia and has a population of 60,000. The Rotenese people are a very respectful, charming, predominantly Christian people. Traditionally their main economic activities have been the exploitation of the Lontar Palm, which they use for everything, from nutrition to building materials. Fishing and more recently, the cultivation of seaweed (agar-agar)provides an income for the local people. During the traditional surf season from May to November the trade winds are consistent and offshore, allowing for comfortable and breezy evenings. Average daytime high temps are 86-88F and nighttime lows are around 75F. The ocean clocks in at a soothing 80F. You’ll fly from Bali or Jakarta to Kupang, West Timor capital city. From Baa you can go by local minibus or by taxi to Malole (1h driving). We offer transfer sevice for our guests. Travel logistics to remote places in Indonesia can get quite frustrating if its not handle with the experience of local guides and operators at each end. Our transfer service was design to get you to the accommodation and back on a quick and comfortable way and with no Hassles. We can assist you with important information (helpful to avoid overnight in Kupang on your way back). “All prices are base on return transfers Kupang-Malole-Kupang”. Once in Kupang airport, you’ll be greeted by our Kupang-Representative named “Oni”, who speak fluent English. He will transfer you to the hotel (already booked) in case you need to stay 1 night in Kupang if you can´t arrive to the fast ferry in the morning or to the 15:05pm flight to Rote (Hotel Rate not included in the price). The day after, Oni will pick you up at the hotel at 7:00am and take you to Kupang harbor to board fast ferry to Rote (vip tickets are provided). Once in Rote you will be welcome by our driver at the harbor or airport. There is a 1 hour drive from Ba’a (harbor city) to “Malole”. 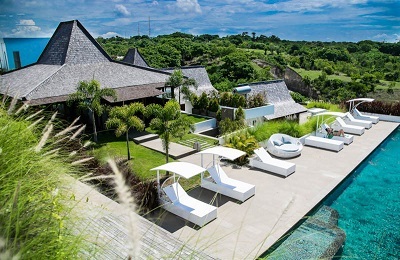 On your way back you may be able to get to Bali on the same day you depart from Rote Island. Or follow the same itinerary with the same arrangements as on your way in. This will depend on domestic airlines time tables. We’ll book you in if available avoiding overnight in Kupang. 3 excellent meals a day (Varied and healthy menu designed and cooked by our international chef). Drinking water, coffee and tea. Zodiac surf transfers to the main brake “T-land”. Information about the Island, local culture, surf, fishing, snorkeling places and more. Airfares organization and Transfers logistics in/out of Rote. "I nearly missed out on the rote island experience as travelling with a friend, I needed to be very conscious of the travel budget. I have done a lot of surfing holidays and this certainly goes down as one of the best including for value. The food is incredible and Maria has done an amazing job of delivering high end restaurant quality meals consistently. You have a direct view out to the main break, only a short walk to catch the boat out and a really relaxed comfortable living environment. The mangrove SUP tour is a must with clear blue water, rock overhangs and enchanting mangrove forest. The free daily laundry service ensures you don't need to bring much. If you are thinking of going for a more budget option but can afford rote island, go with rote island, the food alone is worth it and you won't be disappointed. Last but certainly not least, the owners and staff of rote island are warm, authentic and super modest about everything they do to pull together a fantastic experience. I have no doubt that we will be back." "what a friendly owners and staff! i love how the rooms were clean and really cozy, how they provide different menus each day. it has been one of great experience in east nusa tenggara, which i will definitely be back soon." "Again I booked Rote Island for two weeks and end up to stay five weeks. I was lucky still had vacancy. As usual I was treated like a king and fed like a god by Maria's delicious healthy receipts. even the swell was not the most favourable in this year we got surfing sessions everyday thanks to excact local knowledge. Thanks for the Rote Island Surf House Team and Surf fellows May June 2015! See you soon again!"